Epic Games has become synonymous with Unreal Tournament (and its ubiquitous engine) and Gears of War. These are two things I would never have played – Overwatch is my only regular FPS, and I’ve never been into the military shooters. Despite this aversion, I found my interest piqued in their latest game: Fortnite. With a little encouragement from friends, I pre-ordered a copy and waited with anticipation for the Early Access date. Well, Fortnite is everything I’d hoped and more. The best way to describe this co-op game is, “Minecraft meets Left 4 Dead meets turret defense.” (Coincidentally, those first two were mentioned by Tim Sweeney, founder of Epic Games, himself!) Fortnite is a third-person shooter with elements of sandbox survival games, where you participate in scenarios defending your buildings and objectives against waves of zombie-like monsters. If that description sounds like a crazy mishmash of so many styles, you’d be correct! There’s a basic plot to this game, a world overrun by a supernatural storm that made most people disappear and turned others into “Husks.” You control various Heroes, supported by Defenders and Survivors, as you attempt to rebuild a safe area from the remnants of civilization. The game play is, at its core, a third-person Minecraft survival horror. When you join a mission, you will run around mining materials from everything – trees, rocks, buildings, vehicles, etc. You then take these items and craft everything from ammunition to weapons to traps, and of course… BUILDINGS. While you will find many side activities, from rescuing survivors to searching for items, missions usually end when you activate an objective and fight off waves of monsters. That endpoint is where your design skills come in, using buildings and traps to slow the hordes while you pick them off with your weapons. Beautifully! I’ve spent hours focusing on so many different aspects of the game. The core quest line, various side quests, gathering materials, building my Home Base, searching for schematics, adding to my permanent collection, and leveling up everything. For a completionist like me, this game might be never-ending. Although not an infinite sandbox, the missions provide enough variety by generating random maps in multiple zone-types. Your Home Base does remain static, only expanding after certain missions, so don’t worry about random elements ruining your creation. As a co-op game, there aren’t many trolls, except maybe the person that activates the waves too early. Some people may be more concerned with their own goals than the mission’s, but the game is rather forgiving. I’ve seen three people handle the waves of monsters, while I – sorry, someone else was off mining materials. Game stability is solid, and I’ve experienced minimal lag; in fact, the one time I suffered a frame rate loss, my computer was to blame. Most PC platforms should be able to handle the game, an it’s also available on PS4 and Xbox! There are a few concerns, however, that I’ve noted in my play. Another incident occurred at the end of Early Access, with the servers down for most of the day. Their explanation this time was their attempt to expand the servers for the influx of new players met some obstacles. These incidents and excuses seemed more like a start-up company than one over 25 years old. Also, while the general gameplay is great, the UI and mechanics could use some tweaks. Some actions through the UI require far more steps than necessary, where a one-click should solve the problem. Other complaints include the lack of repairing weapons and the inability to change placed traps. Even bigger news is how the game requires purchase now, but will be free in 2018. Players may question why they should pay for something that won’t cost a dime later. The answer is simple –the game is completely worth the money (plus you get a head start on everyone else). Even with these concerns and the foreknowledge of the game going free-to-play, players probably won’t be disappointed. 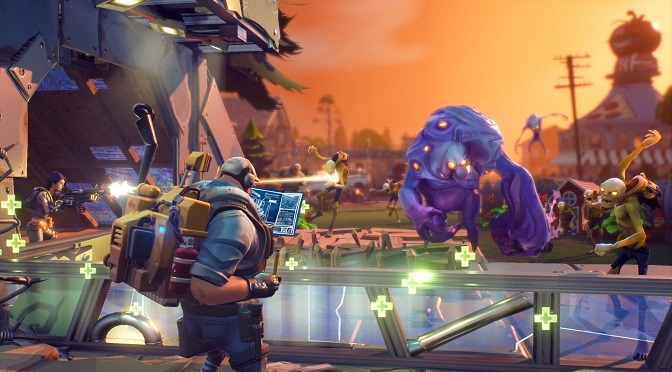 Minecraft, zombie shooter, and turret defense fans can all find something they love in Fortnite. Now, let’s get that pick axe swinging, load up on those materials, and save civilization from the oncoming storm! I give Fortnite 4.5 robot teddy bears out of 5.